e-Penyata Gaji is a service that lets government employees make salary check online. This free service is provided by the Accountant General's Department of Malaysia (Jabatan Akuantan Negara Malaysia -JANM). With e-Penyata Gaji, your pay slip can be accessed online, one day before pay day - quick and easy. 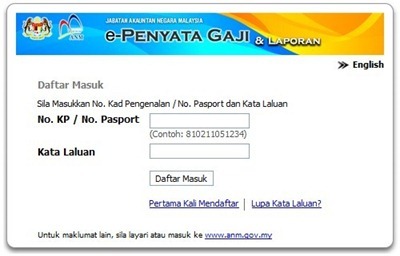 Fill in the required information such as I/C or Passport No., Salary No., Password and Security Question. In addition to making the salary check, you can also check your annual income report. Your online pay slips and income reports can be accessed and printed at any time, for any purposes. For more information or any questions you may contact the Accountant General's Department via email at maklumbalas@anm.gov.my or by phone at 03-88821000.